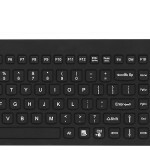 Our Medical Grade Keyboards are sought after because of their top of the line infection control features such as sealed silicone bodies and seamless design. The waterproof keyboards feature lockable keys and excellent tactile feedback. Designed and assembled in our USA headquarters, these devices are ready for hospitals, doctors offices, or any place where infection control is a high priority. If you are looking for a keyboard for a doctor, than the Really Cool is the choice for you. These products are waterproof and beyond — they are Medical Grade.